The Sheridan Yellowjackets basketball team has two representatives on the all-conference team. Pat Moltz, son of Mr. and Mrs. James Moltz, and David Lunsford, son of Mr. and Mrs. Charles Lunsford, both juniors at Sheridan High School, were selected by the coaches of the 5AAA south conference as "all-conference" players. David scored 231 points in 19 games this year for an average of 12.16 points per game. Pat scored 270 in 26 games this year for an average of 10.38 points per game. 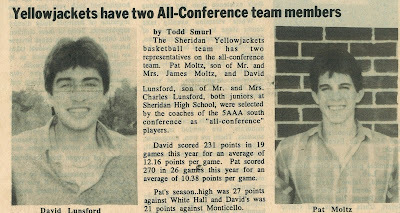 Pat's season high was 27 points against White Hall and David's was 21 points against Morrilton.